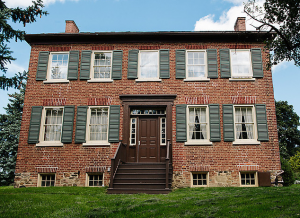 Historic Bovaird House is an exceptional example of a mid-19th century farmhouse built in the Georgian style. The hallmark of Georgian architecture is symmetry and proportion; these characteristics are evident on both the exterior and the interior of the house. The five-bay front elevation, windows, fireplaces and the centre hall plan that divides mirror image rooms create a visual balance that is pleasing to the eye. 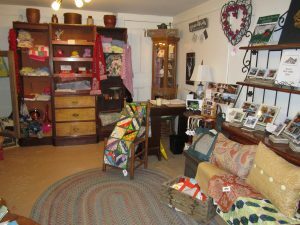 The original carriage shed and ‘buttery’ [cold storage room] located to the right of the side entrance now serve as the Carriage House Gift Shop featuring hand crafted gifts all by local artisans. Also offered for sale are history related publications, Historic Bovaird House postcards and souvenir items. The second storey of Historic Bovaird House consists of four bedrooms surrounding the centre stairway. 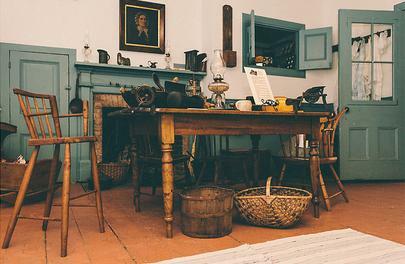 Two bedrooms and nursery are complete with period furnishings while one bedroom serves as a display area featuring both the 1859 Tremaine Map of Peel County and the 1847 Bristow, Fitzgerald surveyors Plan of Brampton, the earliest known map of Brampton in existence. .
What old farmhouse is complete without a ghost? Upstairs in a small nursery adjoining the master bedroom is a wooden child’s bed that was donated to the house several years ago. Thereby hangs a tale . . . . . . . 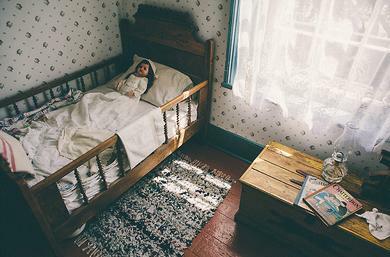 The child’s bed was purchased many, many years ago by a soon-to-be grandmother for her daughter’s first child. After the baby was born the mother sometimes heard gentle noises coming from the baby’s room. On a few occasions on entering the bedroom she witnessed a smokey, spectral light in the shape of a woman standing beside the crib overlooking the sleeping child. The grandmother had little faith in these stories until . . . . . .
One evening when babysitting her grandchild she also heard strange sounds coming from the child’s bedroom. Upon entering the room she saw for herself the same wispy image of a lady at the foot of the bed. Although she did not fear the spirit or sense any danger she immediately removed the baby from the bedroom. For popular special seasonal events at Historic Bovaird House, the large farm kitchen, parlour and dining room are transformed to accommodate Mossie’s Tea Room, so named to honour Mossie Bovaird, the home’s last owner and generous benefactor. 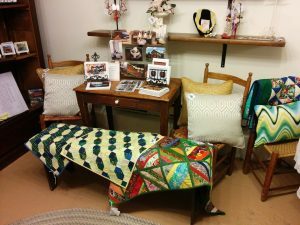 Click on ‘Events’ for complete information on upcoming Mossie’s Tea Room events. 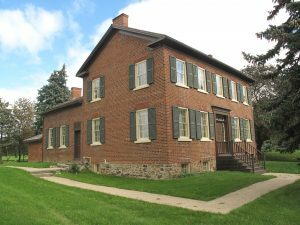 Historic Bovaird House was built using a double brick construction with hand molded bricks manufactured on the property with locally quarried clay. It consists of two storeys plus a cellar. The second floor also includes a labourers or hired-help living quarters, not an uncommon element on a prosperous farm. The house contains five fireplaces, original tongue and groove pine flooring and windows, many still retaining hand-blown glass panes imported from England at time of construction. Many years ago, the approach to the west facing main entrance of the house was via a driveway that ran west to the Town Line [now Kennedy Road]. Today, visitors access the farmhouse by way of the ‘side entrance’ that is situated close to the parking lot. Join the Friends of Bovaird! 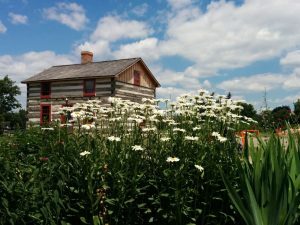 Copyright © 2019 Historic Bovaird House.